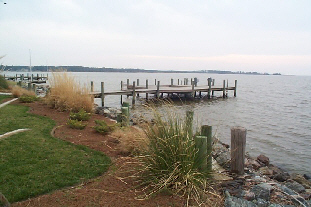 A Williamsburg and Middle Peninsula landscaping and marine construction company providing Williamsburg, Gloucester, Mathews, Yorktown, Urbanna, Deltaville, West Point, Whitestone, Kilmarnock, Tappahannock and surrounding counties complete landscape design services including ornamental plant installation and hardscapes, irrigation and erosion control, driveways and walkways, decks and patios, sea walls, pier and dock installation & landscape maintenance. Don't let your valuable landscaped inland or waterfront property deteriorate. The first impression of your property is the landscaping. The value of your property is very important and professional landscaping increases property value and protects your property from environmental hazards. If you are a homeowner, commercial business, municipal, or industrial site, or on the water or inland, utilize landscape design techniques to maximize your property for identification purposes, for erosion control, screening, safety and security, pedestrian control, or beautification and recreation. All are reasons to landscape your property or business. 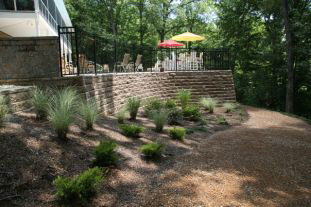 Using environmentally friendly designs and materials, landscaping can compliment your property. Waterfront property has justification for landscaping and construction. Seawalls prevent erosion, and give usable space to waterfront areas, plant material can combat erosion problems, and rip rap can slow down wave action to protect your shoreline. Piers, docks, boathouses are used for recreational reasons and can add value to any waterfront property. 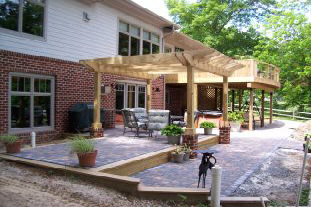 Southern Landscaping and Construction Inc has 28 years of experience in Landscape Design and Marine Construction to protect and add value to your property. Give us a call for an estimate. Williamsburg, Yorktown, Middle Peninsula, Northern Neck, including James City County, York County, New Kent County, King William & King & Queen County, Mathews County, Middlesex County, Gloucester County, Westmoreland, Lancaster & Richmond County, Essex County including the towns of West Point, Kilmarnock, and White Stone. We apply and file for all permits according to codes and compliance. and irrigate your yard and build you a pier and dock."